At this time, I began getting more traction in my writing journey–my biggest feat: this post blasted to over 100 million people (shocked emoji inserted). The path I was on continued to lead me to a bunch of “yes” responses for guest posting on various sites. Yet, I suddenly felt myself suffocating under the weight of it all. I had said one too many “yes’s” in order to appease the crowd and build my writing resume. It was all getting to be too much. I submitted myself in prayer. God gave me the peace and assurance I needed to move forward with a hard decision. It wouldn’t make much sense to those of you who aren't familiar with the process of what it takes to grow a community of readers and listeners or build my platform as a rising writer and speaker. But I knew the things I had said “yes” to were not the things God wanted me to pursue at that time. So I did one of the hardest things: I apologized and backed out of my obligations, saying “no” to all of those people I had committed to. But then, the most amazing thing happened…I felt free! At peace, knowing I was right where God wanted me. Although I didn’t understand it at this time, God wanted my schedule open to prepare me for my next big assignment. It was a typical #momlife kind of day: stressed out, overwhelmed, overrun by three toddlers. My two-year old daughter beckoned me to sit and color in Mickey Mouse with her. Feeling the mom guilt, I hurdled over all the hard plastic toys (waiting for a soft foot to land) and sat next to her in the much-too-small-for-me chair. With our markers, we sat and colored in Mickey characters. I had been doing a bit of research on anxiety–due to my own struggle with it. The multitude of adult coloring books are everywhere these days, but I remained skeptical as I didn’t really believe they would help me with my anxiety struggles. Yet, this moment with my daughter changed everything. I pulled out my phone and clicked on a devotional app. Yes, this is softening my soul in ways the book wasn’t reaching. But soon my daughter noticed my face glued to my phone. With my attention clearly off my daughter and the coloring at hand, I knew this method wasn’t going to work. Jumping on the ever popular Amazon site, I searched for a book which included both adults and children with devotions and Scripture. My results? NOTHING. I couldn’t find one book like this. Right then, the idea for this book began to form. I prayed and dreamed throughout the day, asking God for direction. For clarity and peace to know if He was in this dream. Now, I KNOW the context of this Scripture is completely different. But... you know when you read something in Scripture and it has a special kind of ring to it? Like God is trying to tell you something through that verse, or passage, or story that relates specifically to you in that moment? This was one of those moments. After praying and asking God for confirmation, I knew this was it. I read it to my husband along with some other Scripture verses I had come across that day which all seemed to fit. He agreed. What happened next was seriously crazy. Let me tell you upfront: I am NOT a night owl. Honestly, I love my sleep. I rarely stay up past 9:30 pm (10 pm max). It’s just not my thing. Create a Query letter (like a cover letter introducing you, your book idea, and why you think it’s worth investing into). Create a Proposal (non-fiction book: Bio, Marketing plan, Platform, Competitive Works, Target Audience, Endorsements, Synopsis, Writing Sample–3 Chapters). This can take MONTHS to YEARS to complete. Pitch to a number of Literary Agents (perhaps a few smaller Publishers if you can obtain the direct submission email). Personally craft each one and abide by their agency guidelines before submitting. Wait, wait, and wait some more! (Sometimes you hear back from them, but most often not. If they don’t want to represent you, you will likely NEVER hear back. If you hear back, it still may be a “no” but with some helpful feedback. It’s quite an exciting day when you get a “yes” response (like winning the lottery.) Literary agents usually get hundreds of email requests per week from aspiring authors submitting their manuscripts, hoping for a “yes” response and an agent contract to represent their book. Once you hear a “yes” from an agent, you sign their contract and the agent now pitches it to Publishers they think will be interested in giving you a book contract! As you can see, this is typically a SLOW process and fairly competitive. So of course, I hammered out my Query letter first, because any writer knows it can take MONTHS to YEARS to hear ANYTHING (if that) from an agent. I pitched it to a few agents while I began to work on my proposal, thinking I’d have a few months to figure it all out. At this point I had NO illustrator in mind. After delaying a bit, I frantically contacted a few big name illustrators, whom I never heard back from. I had no clue what to do. So, I did the only thing I could do: got down on my knees and prayed. I kid you not, that night after praying, I was scrolling through Instagram searching for an illustrator using the hashtag #shepaintstruth, and came across an image that caught my eye. Noticing this illustrator was local (Los Angeles area) and a mama to one, I felt compelled to contact her. My encouragement wall to keep on keeping on with this project! Shocked awe doesn’t even describe it. So of course she said, “Yes” much to my delight. She hammered out a few sample pages and we sent it off to the agent! Celebrating with my daughter my first contract! I wish I could tell you the agent said “YES”, but it was, in fact, turned down. Along with five more rejections we received by agents over the next five months. Holding my book for the first time! So we continued to press forward, until I randomly came across a direct submission link to B&H Publishing. It was a long-shot (they are a BIG publisher and typically require agent representation), but I pressed “send” before thinking more of it. Jacy with her daughter holding her book for the first time! 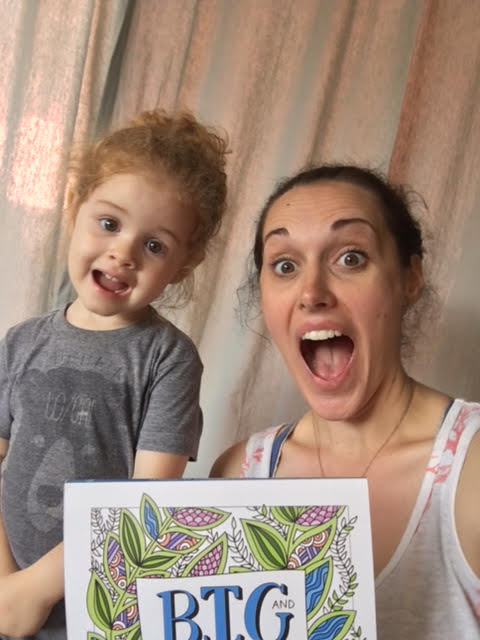 It has been nothing short of amazing to see how God has worked to get this book, Big and Little Coloring Devotional, into as many hands as possible, as quickly as possible. We barreled full steam ahead with only a few short months to complete it (this was also during the already crazy busy holiday season). From the special marketing incentives LifeWay gave, to the unique perspectives the team of B&H Publishing gave making this book a total winner, to the extreme attention to detail Jacy Corral invested into the creative illustrations of this book, I have been beyond blessed to work with so many amazing people who made this dream a reality. I hope you can see how this truly is so much more than a coloring book. It is a work of art orchestrated by the Creator Himself. So now, without further adieu, we are excited to bring this faith-filled, fun de-stressing book to you and your “little” to enjoy.